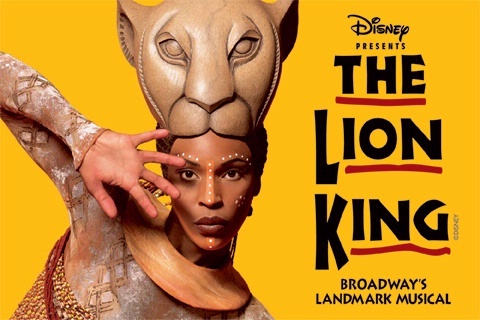 If you have always wanted to know how to get into a big Disney show, here is your chance because Disney’s “The Lion King” has announced auditions for the bigger than life production. The production will be in New Jersey, at the performing Arts Center, looking for talented kids to play the role of Simba and Nola. Kids of all ethnicities are welcome to apply and the production is looking for children who are a triple threat… They have to sing, act and dance. The auditions will consist of kids learning a Disney song and then performing it for the show’s casting directors. The lucky and talented kids cast in the show will become part of the touring production and maybe even appear on Broadway. Child performers will get an equity contract that will pay a minimum of $2000+ per week, not bad for a 10 year old. 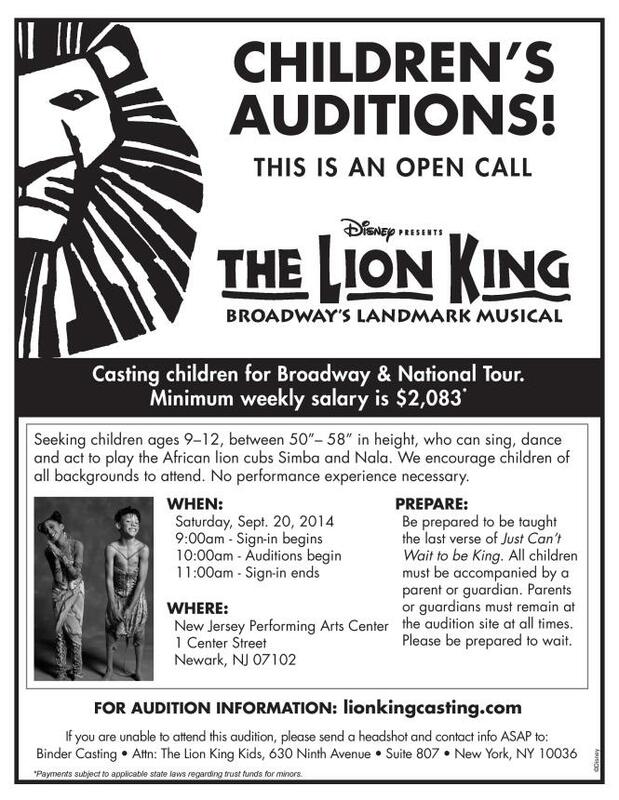 Disney “The Lion King” is looking for kids between the ages of 9 and 12. Kids do not need to have actual experience on stage but they must be able to sing and dance. The story goes something like this…. In the Pride Lands of Africa, a lion rules over the animals as king. The birth of son Simba to King Mufasa and Queen Sarabi creates envy and resentment in Mufasa’s younger brother, Scar, who knows his nephew now replaces him as heir to the throne. After Simba has grown into a young cub, Mufasa gives him a tour of the Pride Lands, teaching him the responsibilities of being a king and the circle of life. “The Lion King” is one of the most beloved shows on the planet. The production has been seen by over 70 million people worldwide and the show has won 6 Tony Awards, including Best Musical. Tony Award winning director Julie Taymor brings to life a story filled with hope and adventure set against an amazing backdrop of stunning visuals and even more spectacular costumes. Disney brings the jungle to life on stage and kids in the New York area have a chance to be part of the magic on stage. 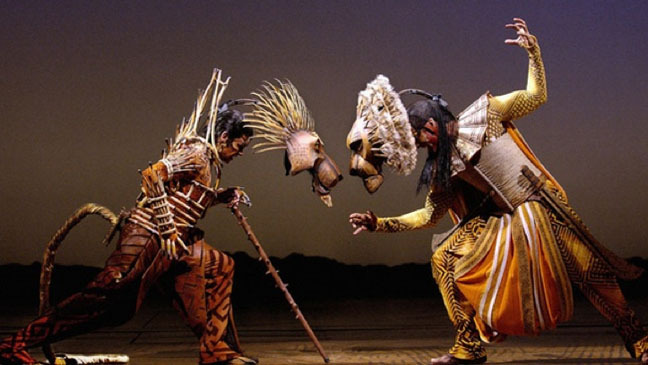 THE LION KING also features the extraordinary work of Tony Award winning choreographer Garth Fagan and some of Broadway’s most recognizable music, crafted by Tony Award winning international singer/songwriters Elton John and Tim Rice. Giraffes strut. Birds swoop. Gazelles leap. The entire Serengeti comes to life as never before. And as the music soars, Pride Rock slowly rises from the mist. This is THE LION KING. While you don’t need to have any acting experience, you will need some preparation before the audition. You will need to sing the last verse of “Just Can’t Wait to be a King“. Children auditioning will be taught the song but it is probably a good idea to practice it and know it beforehand. Of course, all kids will need to be accompanied by their parent in order to try out for the Disney show. For more information on the upcoming auditions please see the below casting flyer for details. I would love being in lion king. I’m from South Africa, working with Africa Umoja. I’m here in America performing for few month. I like to experience new things that will keep me strong everyday because one day I want to have my own theatre production, that’s why I want to put myself in big things that will challenge me in life! Hi my name is Saoirse and I am 12 years old. I would love to be in the lion king! Wild cats are my favorite animals and since I have been in movies it’ll be as easy as pie! And if you need any help with any art I’m your go to girl because I’m one of the best artists at dayspring academy.